Forest Watch is interested in providing enrichment materials for teachers in science, technology and math, three of the STEM education fields. 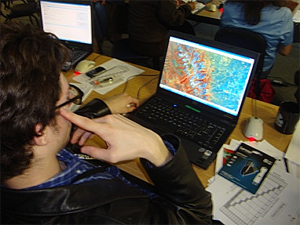 Forest Watch also aims to introduce teachers and students to 21st century perspectives in learning such as how remote sensing tools from space can be applied to biological and chemical studies in the school yard. Forestry studies of white pines introduce students to skills and tools used in many environmental fields. Students select five white pine trees to be permanently tagged near their school. They establish a 30x30 meter sampling plot. They learn a suite of forest plot biometric measurements such as tree height, diameter at breast height (DBH), canopy closure and ground cover. Forest Watch students love to core their white pines to count tree rings and to calculate the age of their trees. Students also love using global positioning systems to find the latitude, longtitude and elevations of their schools. 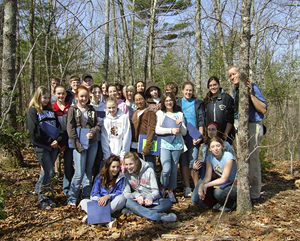 Forest Watch students, Merrimack Middle School. Each year, they collect samples of needles from two sides of the five trees. They learn proper protocols for preserving living samples for the school and UNH laboratories. These activities involve learning skills in observation, teamwork and field studies. They also involve subject matter in measuring, simple mathematics, algebra or trigonometry, and botanical work in plant identification, the use of dicotymous keys, and plant anatomy and growth. Many schools incorporate student drawings, journaling and other skills in field activities. Forest Watch classrooms become biological laboratories as students collect and build biometric data with their fieldwork and samples. Students measure and record some 20 different measures of white pine needles as they consider the health of the needles and look for any signs of ozone damage. Students perform simple mathematical calculations of percent damage. Students measure and calculate water content of the needles. And they learn to make fresh sections of needles and to study plant anatomy at the microscopic level. Forest Watch students invariably discuss the relationship of plant and atmospheric chemistry. What is ozone? How is it formed? How do plants react to air pollutants? What anatomical features protect plants from damage? Why is the white pine an indicator of ozone damage? Many Forest Watch schools go on to discuss the Clean Air Act, automobile exhaust and other sources of air pollution, and how student data has helped to improve air quality in New England. Forest Watch students and teachers submit a set of needles to UNH for spectral analysis. The needles are scanned in the Forest Watch Visible Infrared Intelligent Spectrometer. Readings of reflectance from the needles is returned to each school. The reflectance of plants measured in the laboratory can be correlated with reflectance captured 500 miles above by Landsat remote sensing. This part of Forest Watch introduces students to the growing interconnection of biology with the physics of light and the chemistry of photosynthesis. The reflectance curves of white pine needles provide information about chlorophyll content, water content and general age and health of the needles. Forest Watch also invites schools to apply remote sensing data, satellite imagery collected by Landsat Thematic Mapper, to their school studies. The light reflected from one school’s white pines will be similar to light reflected by an entire white pine forest. As students learn about the health of their white pines, they can extrapolate that information to “read” the health of a region’s white pines. Forest Watch provides very inexpensive or free materials to teachers. Workshops for training and upgrading teacher skills are scheduled each summer. The Forest Watch staff also visits Forest Watch schools to assist at any stage of a Forest Watch program. A Fine Report on Trends in air pollution was published by the EPA in 2008. Six Common Pollutants is available on the EPA web site. Is Today An Ozone Day? Check out current air measurements on the EPA’s www.airnow.gov, for conditions anywhere in the nation. More particular measurements in New Hampshire are available on www.airmap.unh.edu When ozone rises to 70 ppb, what factors do students see in your area which might contribute to O3 production? What’s on the Wind? Visit the National Oceanographic and Atmospheric Administration’s HYSPLIT website to learn where the winds come from and what that plume of air might contain. This site requires you to register, but it’s free. Students must have latitude and longitude, elevation, date and time. Is your white pine growing taller or shorter? Large sets of data are a great introduction to calculus, the mathematics of change. Even young students can examine how a school's white pines have changed in height or dbh over the past few years. Which team was more accurate? How Do I know This Is A White Pine? Students can draw and photograph white pines. Do branches droop? Or soar? How do needles fit together in one fascicle, the little bunch at the end of a twig. How many needles in one white pine fascicle? How many needles in a red pine? Look at the needles with a hand lens. How do the tiny needles fit together with the other needles on the fascicle? Draw it!